Denton, Texas. In the middle of the bright blue sky patrolling the plateau, a multicoloured balloon appears, made of rags; standing in the basket, a man observes the landscape with an old telescope. A small group of armed men, having their face covered with salt and dust, comes out of a grove, guns leaning on their shoulders, jerking on their slim horses, too tired to go on. A camp of soldiers with ragged uniforms: in the loneliness of his tent, one of them opens a crumpled letter. A deer with huge antlers plunges in to the void from a cliff, greeted by the last sun ray. 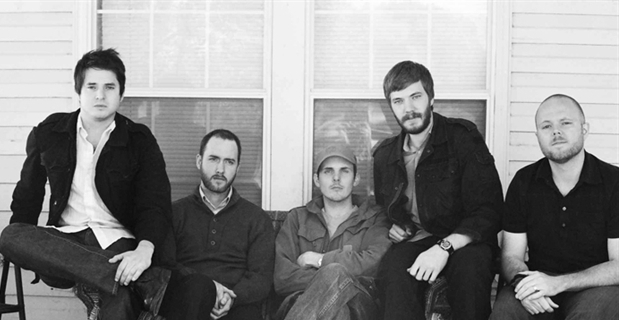 These are some of the images Midlake, and Tim Smith in particular, have given us in their still brief career. With their music, bizarre and familiar at the same time, they have spoken and speak of times of strong emotions and simple needs, of dreams of complete immersion into nature, of heartrending love stories. Before going through their career, we have reached them during their latest European tour, which is not touching Italy. Guitarist Eric Pulido answers our questions. Where are you in this moment and where was your last performance? How is the tour going? You’re travelling a lot, but without stopping by in Italy… Why is that, can you tell us? We're in Dublin at the moment and last played in Bristol. The tour has been great for us. It's been a while since we've toured so it's been a treat to get out again and play songs both new and old. I'm not sure why we haven't stopped by Italy yet, but I promise we will soon enough! A very simple question, which apparently only a few people have asked you, is about your name. Where does it come from? Since your first Ep, “Milkmaid Grand Army”, your music changed at a slow but steady pace. Do you have a kind of a “final goal” in mind? For instance, do you think you are getting closer to that “Jethro Tull” sound you crave for on your Wikipedia page? The music has changed over the years because our taste has changed. We never set out to sound like a band or reinvent the wheel either. We just always want to make a great album that we'd feel proud of years later. We've of course made some missteps, but we've grown in many ways and feel good about where we are now. “The Trials Of Van Occupanther” was often defined as sounding like Fleetwood Mac or Neil Young, while “The Courage Of Others” comes from an immersion in British folk (Fairport Convention, Pentangle and obviously Jethro Tull). Do you still feel like a contemporary band, and how? Well, we are a contemporary band, but our sound is often influenced by bands of yesteryear. Many bands are influenced by that era, and it's all a matter of how you interpret those influences. There is something warm and natural about a lot of the older records, and that's something that we like to capture. Something which really impressed me was your passion for old furniture and antiques in general. It obviously matches a lot with what you write, with the feelings you communicate with your music. If you had to go to the core of your passion, how do you explain your fascination with older times? How much is it a longing for an “ideal” place and time? Or, maybe, is it a factual one? I'm sure there's a romantic idea of times being better back then. 'The grass is always greener on the other side', right? We do love living in modern times and enjoy all the benefits of today's technology, but there is something about things, whether that be music, furniture, architecture, etc that seemed like it had more care and honesty back then. Does this fascination reflect on the instrumentation you use, on recording techniques and such? We just try and make it sound emotional and feel good. Whatever that might entail, we try. There's no equation to getting there, but we just try and get inspired by music and use our ears and hearts to decide when its right! “Bring me a day full of honest work/and a roof that never leaks/I'll be satisfied”. Let me tell you I find that these are wonderful lines. After all these years, that you have spent touring all around the world, in which you have reached international popularity and so on, do you still feel the need for “heading home”? What do you miss most of Denton (or wherever else)? Of course, we always miss home when away. We miss our wives, kids, dogs, friends, local coffee shop, everything! It's great to see familiar faces and fans enjoying the music around the world as well, but nothing beats home. I have to be fair to you: “The Trials Of Van Occupanther” is my favorite record of the past decade. Do you feel the weight of such a successful work? For instance, did you feel the need for keeping a certain distance from it when you composed “The Courage Of Others”? The cover of “The Trials Of Van Occupanther” shows a quite enigmatic image. When I see it and I try to match it to your music, “The Village” movie comes to my mind. Maybe also for this feeling of a pristine, simple world that the record communicates… Is there any relation to the movie? Which story, in any case, is behind that cover? No, not that movie. It was inspired by an ad that Tim found and we kind of played off of it. Tim has also been a big fan of the movie 'Andrei Rublev' by Andrei Tarkovsky and both the cover of "Van Occupanther" and "Courage", in a closer way, had influences of that film for sure. Your first two albums were dominated by these bizarre characters, “Trials” especially: they clearly have a strong narrative push. Your new record doesn’t show any (of these characters): can you explain to us the different songwriting dynamics which underlie “The Courage Of Others”? I agree, but Tim has said that it wasnt really planned. This album just seemed to take more of a first person tone in the lyrics and I think it fits well with the music. Speaking of narrative ability and such, would you ever write a concept album? Would you write a soundtrack? A soundtrack would be fun given the right movie. Madeline Wood is Eric Nichelson's wife's clothing line. She makes some great clothes and everyone should check it out. Cappulido is my little coffee endeavor where i sell coffee online and locally. I work with growers first which is a great cause and the beans taste amazing! It's just a fun hobby, but there's never a shortage of coffee at home or in the studio! Nature, its beauty, the awe of men before it seem all to be major themes of your new record and, to some extent, of “Trials” as well. Without going into one-million dollar questions, how do you rate Obama’s environmental policy? Politics can be a tough subject, but one thing's for sure, I'm glad its not my job. We leave the politics to politicians, support our country and the officials put in to office, and hope they don't mess it up! Would you tell us something about the record you’re playing and producing with your friend John Grant, The Czars’ singer? How does it sound? It was a really cool thing to be a part of and the record sounds amazing. I'm really excited for John and think that everyone should check out the record. It's called "Queen Of Denmark" and it comes out on Bella Union in April. As a last question for you, I would like you to tell us the last dream you had. That I would be doing an OndaRock interview... Dreams do come true!